Online sales are not available on this style. 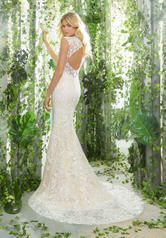 Frosted, Embroidered Appliqu�s with Cross-Stitch Detail on a Slim Tulle Fit and Flare Gown with Sheer Train. Available in Three Lengths: 55�, 58�, 61�. Prom USA Bridal & Formal Wear Boutique is a family owned and operated boutique that has been serving the southeast with formal wear since 1990. We specialize in Prom, Pageant, Bridal, Bridesmaid, Mother of Bride, Special Occasion, and Flower Girl gowns. We also carry shoes and accessories to add the finishing touches for your special day.